We can’t tell you guys how often we get asked about our favorite wineries close to the Reno area. Now, we finally have a blog to point everyone to our most loved wine country around! We’re talking all about the El Dorado county wineries, an area that can be a quick day trip or a weekend getaway. El Dorado county spans west from South Lake Tahoe to just shy of Folsom, California. It is home to many gold rush era towns and more importantly, to more than 40 different wineries and vineyards. This is because some of the most fertile and diverse soil exists in the county – making it unique and prosperous for wine makers. It can be daunting trying to plan a trip to wine taste in this area, so we’re here to give you all our recommendations since we’ve been visiting this area often over the years. We’ll be focusing on the wineries near the towns of Placerville, Camino, Fairplay, and Somerset, although they all kind of blend together to make up the El Dorado area. You can check out this great map of the wineries in the county and should consider printing it out for your next wine tasting adventure. Now obviously, we’re not going to talk about all 40+ wineries – even though we have visited our fair share of those 40 over the years. We’ve condensed the list to our top 8 favorites that we think are worth the trip, especially for first timers. Personally, we like this area 100 times better than the overrated Napa Valley wine country. This is mainly due to the fact that most of the wineries offer free tastings (or the tasting fee goes towards your bottle price) but also because of the hospitality that comes from a boutique winery. We choose to make our home base in Placerville most trips and like to spend two days here for the weekend, although you can do this in a day trip as well. Just make sure you designate a sober driver to get you home safe after a day of tasting! For anything else you need to know about the El Dorado and Placerville area you can find it out here. El Dorado county can be reached from a few different ways. Since we are based in Reno, we’ll start with the route we like to take from there. The first option and the one we take the most, is through South Lake Tahoe on Highway 50 Westbound. It’s a straight shot that sends us right into the town of Placerville and is an extremely beautiful drive. The second option is on Highway I-80 going Westbound until you hit Auburn, then onto CA-49 South, where it will drop you into the valley and into Placerville. Each route will take you about 2 hours and 20 minutes, depending on traffic. If you’re coming from Sacramento, it’s an easy hour long drive on Highway 50 Eastbound and a great way to get out of the busy city! Two of the biggest events that happen in this area are the Passport Weekend wine event and the Apple Hill season. We’ll start with Passport, a fun wine tasting and pairing event that happens for two weekends in the spring. This is one of the main reasons we have come to love the wineries we do in this area. Although the number of participating wineries have started to dwindle a bit since the first year we went, there was still more than 20 wineries on the list for the year of 2018. Basically, you pay $60 for a weekend full of tasting and eating – and each winery has a different specialty spread laid out for patrons. The food ranges from appetizers and finger foods to full blown lunch sized portions including desserts, it just depends on the winery. Most of the wineries offer half case and full case specialty prices, a great bang for your buck to bring home your favorite wines. Pro Tip: Set yourself a budget for how much you want to spend on wine, once the tastings get going and the wine starts flowing – it’s really easy to start wanting to take it all home! The other big event is the Apple Hill season, which is really a one month event of all things fall. This usually starts the last couple weeks of September into the end of October/beginning of November. It is when all the apple farms, Christmas tree farms, and pumpkin patches open in the “Apple Hill” area. On a map, it would be considered the whole area North of highway 50, all of the Camino area. There are more than 50 farms in the area that grow and sell apple related products, veggies, fresh fruit, pies, desserts, ciders, and really anything and everything related to all that. Although a lot of the major farms are open year round, the Apple Hill season is the busiest because it is when most of the farms harvest their fruit and all the pumpkin patches open! We’re currently working on a post all about our favorite farms, but until then you can check out the official Apple Hill website for any questions. A couple of our top wineries are located within the Apple Hill side of the county, although there are some more that we’ve been to but don’t consider our top favorites. We’re not big into white wines so most of these wineries we have fallen in love with because of their red wine options. Every now and then we try a couple white wines and if we’re in the right mood, we can get down on some rosé. This area is specifically known for the way they are able to grow certain grape varietals, especially grapes from Bordeaux, the Rhône, Germany, Italy, and Spain – so their red wines are on point. And a lot of them are award winning. Don’t let us stop you from trying all the white wine your little heart fancies, just know that a lot of our opinions are based on our love of a good red wine. So in no particular order, here are our favorites! This is one of our very favorite wineries, ever. Not only do they produce some of the most phenomenal wines but the owners, Teena and Frank are some of the kindest, most hospitable, and sweetest people you’ll ever meet. We have gotten most of our friends hooked on Narrow Gate wines and almost all of them have become wine club members. The wine will get your attention, but it’s Frank and Teena that will keep you coming back! Make sure to try their flagship wine, Dunamis and their Chocolate Splash – best dessert wine in the area! Pro Tip: Try to plan a visit for one of their events or for Passport weekend, you’ll get to try Teena’s delicious culinary creations to pair with their wine. We fell in love with Fenton Harriott at the Passport Weekend and it became our first and only wine club membership. Their red wines are some of our favorite in the area, especially their rich and deep Sangiovese – which was part of the reason we joined their wine club. We love the vibes of Fenton Harriott because each visit we’ve felt like family and enjoyed the more intimate feel of their tasting room. The grounds of the vineyard are also great for hanging out for the afternoon, especially if you bring your own picnic to enjoy under the pavilion or one of the shaded picnic table areas. You can also play bocce ball while sipping on a glass of wine and partake in their many events throughout the year. Miraflores has quickly become one of our favorite wineries in El Dorado County. We visited a few years ago for Passport Weekend and indulged in their barrel tastings – which consistently brings us back since it’s one of the handful of wineries in the valley that does them. We like coming to Miraflores for events because they know how to throw a party, but our favorite visits have been the ones on a random weekday when we get the tasting room all to ourselves. Their beautiful venue makes you feel like you’ve suddenly teleported to somewhere in Europe, sipping on a glass of wine in the courtyard overlooking the valley. Pro Tip: Come on any Monday and meet Diana, the best winetender in the biz. She’ll make your experience even cozier and more comfortable plus she’s super knowledgable about their wines so she can answer any of your wine related questions! This place is a Tavener favorite to sit and drink a bottle of wine. The grounds of Boeger are some of the quietest, most peaceful around and any visit to the Placerville/Apple Hill area is not complete without a stop here. While Boeger does have a tasting fee for their wines, it is usually waived with a bottle purchase. They will give you glasses to take outside so you can enjoy the scenery and the sound of the nearby pond. We recommend getting our favorite, the Barbeara and finding a place to picnic or relax. We stop here just about every time we’re in the area and we never get tired of the wine or the view! As much as I wish I was related to this family – my maiden name is Skinner and I make sure to tell them every time – I unfortunately am not so we’ll just have to stick to buying wine instead of getting the family discount! While their red wines are not our favorites, we surprisingly do enjoy their white wines – which is not our normal go-to. But in all honesty, we usually just hit up Skinner for the views. They have an unparalleled panoramic view of the Sierra Foothills valley and the best patio area for enjoying the scenery with your wine. During the Passport Weekend, they have a great spread of food – most notable is the pizza from their outdoor pizza oven. Perry Creek has become one of our most liked wineries in the El Dorado area. They have some of our favorite Cabernet Sauvignon, a great Zinfandel called Zinman, and offer killer deals on half and full cases. During the Passport Weekend, they offer barrel tasting and a chocolate fountain in the middle of their tasting room! In our experience, they have the best spread for food during Passport – especially since there is always a catered BBQ’er cooking up some kind of delicious meat to pair with the wines. The winery is tucked back on a big property and offers a nice deck to sit and enjoy the live music they have playing on most weekends. This winery is a new find for us but we liked it so much we added it to our top list in El Dorado. Their eclectic tasting room and outdoor hang area are so much our style that we felt at home when we first visited Chateau Davell. The wine menu is a little smaller than most wineries, but this is because they have limited productions of wine that change with the seasons. Chateau Davell is family friendly, the grounds are equipped with a playset for children and a corn hole set for kids and adults alike. Tastings here are $10, so we recommend buying a glass for a few bucks less and heading outside to enjoy a game or two of corn hole on the lawn. We know this technically this isn’t a winery, but it needs to be visited while you’re in the Placerville area. It’s a favorite of ours on any visit to Apple Hill or wine tasting adventures. Not only do they make great beers but they also have a cidery on the side of their brewery where you can try their specialty ciders, meads, and cysers. During Apple Hill season, they have vendors and food booths but can get very busy! Try their Black and Blue – their version of a black and tan, a mix of the Oatmeal Stout and the Blueberry Pale Ale, a fan favorite! They also recently opened a restaurant and taproom in downtown Placerville with exceptional burgers and all their flagship beers. Check them both out for double the Jack Russell fun! These don’t make our top list for wineries but if you happen to have more time in the area, we recommend giving these places a try. ◊ Lewis Grace – This is a good stop while you’re here during the Apple Hill season, especially during Nevada Day Weekend when you get a discount for being a Nevada Resident. We usually hit up Lewis Grace because we LOVE one of their white wines, Torrontés – so we grab a bottle to go. The winery is actually owned by Nevada natives who moved to the Placerville area so we like to stop in every now and again to support our fellow Nevadans. ◊ Charles B. Mitchell – This one is a bit further than most of the wineries mentioned above but we wanted to shout it out because they do barrel tastings. In our opinion, the barrel tasting is the draw to visit, although we do love their Pizza Blend Zin. They don’t participate in the Passport Weekend anymore but if you are in the Southern area of El Dorado county, it’s worth checking out. During the weekends or when they have a wine club event going on, Charles B. Mitchell cranks out pizzas to pair with their wine. Pro Tip: You can stay in this cute cabin located directly next door to Charles. B Mitchell. It’s the perfect spot to explore lower El Dorado and FairPlay county wineries and a great spot to retreat away to after a day of wine tasting. ◊ Windwalker – We started a Passport Weekend here once and LOVED the buffet they had for their food. If you make it to Windwalker, go for their award winning Primitivo or their array of other red wines and sit down on the shaded deck area with a picnic overlooking the vineyard. We have stayed at our fair share of places in Placerville, both Airbnb’s and hotels. Usually, we pick which type of lodging we want based on whether we’re going alone to wine country or with friends/a group of people. We usually do an Airbnb for the weekend if we have a bigger group or we’re doing an event in Placerville like Passport weekend. There are many great options in the area that are equipped with everything you need for a group stay. We usually choose a budget hotel if we go just us two of bring another couple. 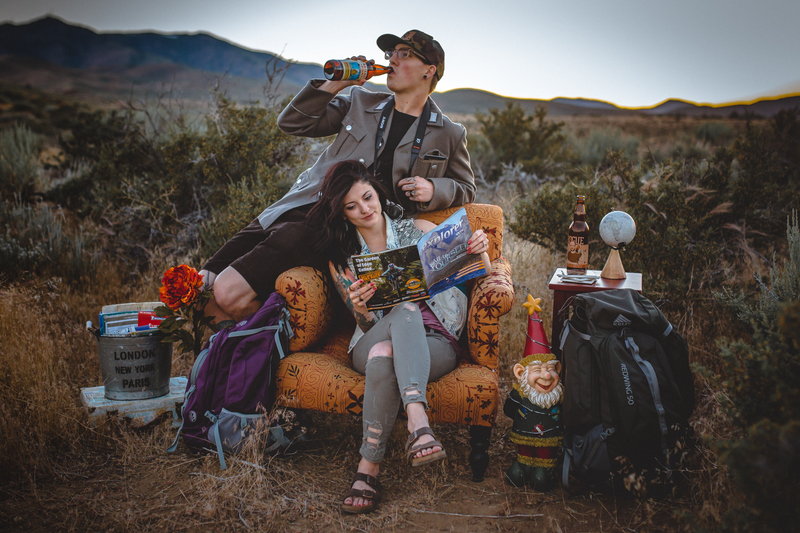 Some of our go-to’s are the Mother Lode Motel, Gold Trail Motor Lodge, and the National 9 Inn, a string of hotels all owned by the same family with the basic amenities needed to come and crash after a day of wine tasting. If you’re feeling fancy or want to be within walking distance of the downtown area, find yourself a room at the Cary House, a historic hotel on Main Street. Pro Tip: Use our code when reserving your room and get $20 when booking! Most of these are our go-to’s for grubbing when we’re in Placerville because we’ve found where we love with consistently good food, so we don’t branch out too much anymore from our favorites. Food in Placerville is a bit pricier than we are used to spending, but the quality of the food is worth the dollar signs. We have two favorite breakfast places in Placerville that we hit up every time we’re in town. Since we’re usually here for a weekend, we get to eat at both each morning! ◊ Sweetie Pie’s – This is the perfect place to start your wine tasting experience because the portions are HUGE and will fill your belly so you can fit more wine in it. They make their own breads and jams, our favorite combination being the olallieberry jam with cinnamon apple bread. Another favorite of ours is their French toast or any of their omelets with home fries. Trust us when we say you can’t go wrong with any of their breakfast items. Sweetie Pie’s can get busy on the weekends so make sure to call ahead for reservations but don’t miss it when you’re in town! ◊ Cozmic Cafe – This little coffee house is housed within an old mine shaft and offers lighter portions of breakfast, smoothies, and of course coffee. They offer more organic, healthy options than Sweetie Pie’s does, so it’s a good choice for all the vegans and vegetarians out there! There’s also a bar upstairs that opens up in the evenings and usually offers live music, although we’ve never partaken in the area upstairs on our visits. We rarely ever eat lunch within the town of Placerville because we usually bring a picnic to eat at a winery, so most of these are places we’ve tried out for dinner. All of these restaurants do have a lunch menu though and most have a happy hour so you can get the most bang for your buck on food and drinks! ◊ Thai Unique – This is the most budget friendly option out of the dinner places we’ve been in Placerville, and it doesn’t skimp out on quality. It’s off the main drag, which probably helps them keep the prices down, but it’s pretty close to the budget hotels we listed above. It’s a great option for those who want something different than the typical American cuisine! ◊ The Independent – This was our go to for dinner for a long time when we first started visiting the area. The food here is exceptionally delicious, especially the Independent Burger or the Salmon Avocado Burger – we’re a sucker for a good burger and this place delivers. We also recommend any of their steaks paired with their truffle mac and cheese, an Independent staple! ◊ Smith Flat House – Our favorite restaurant to date in Placerville has quickly become the Smith Flat House. The fare here is top notch, specifically the meat and the seafood. They also offer a local wine list – including 4 of the 8 of our favorite wineries! Ask for a table in the cellar for the ultimate experience and make sure you call ahead for a reservation – it can get very busy! ◊ Bricks – This Main Street eatery has some great appetizers, we definitely recommend stopping in for the happy hour. Bricks has a few unique menu items that differ from the rest of the restaurants we frequent in Placerville, so it is worth a visit for a gourmet evening out on the town. Even if out just make it here for drinks – try any of their specialty cocktails and you won’t be disappointed! Hey, if you’ve made it this far – you are the real wine MVP. We would love to know your favorites in the El Dorado area and any more recommendations that we can add to our list! We hope this helps you plan your next wine tasting trip!